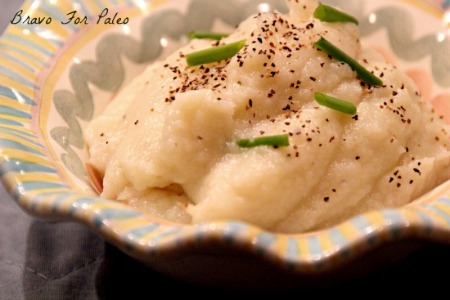 Mashed cauliflower, who would’ve ever known it tastes just like mashed potatoes! I call this side dish faux-tatoes. I can honestly say I could eat a whole head of cauliflower when I make it like this… whoops? Good thing cauliflower is excellent for you! What’s so great about cauliflower? When you’re craving a comfort food without the guilt afterwards, this is the perfect recipe for you. The Faux-Tatoes are made with cauliflower but taste just like your favorite mashed potatoes from Thanksgiving Dinner. Cooking Tip: Although you may be tempted to buy cauliflower that can be cooked in a microwavable bag, take the extra time to steam it yourself. When you microwave foods you lose some health benefits. Flavor Tip: I like using Himalayan salt on this versus sea salt. Cut up and steam cauliflower until the fork can easily puncture the vegetable. Add cauliflower to food processor. Pulse cauliflower until creamy texture. Top with salt, pepper, chives and optional butter. Why am I here? Why would I create this blog? It started a few summers ago, when the healthiest and most important man in my life found out he had 3 blockages to his heart, one being a 90% block in the Widow Maker, which usually results in death. My dad was one spike of blood sugar away from a heart attack. When he realized someone like him, the picture of health, had heart disease he searched for a problem in his lifestyle. At the time he believed he ate a fairly wholesome diet, and throughout his life he had been a high school athlete, college rower, a triathlete competing in Ironmans, and had recently joined crossfit. What was wrong? After extensive research for the best diet on Earth, he found the one we were designed to eat. He found the diet that humans evolved eating, The Paleo Diet. Call it what you may, Caveman Diet, Primal Eating, or the other versions people have trademarked to make money. To me it’s the only definition of a healthy diet. He began eating this way- avoiding all grains, dairy, soy, refined sugars, and legumes- sleeping longer, walking more, lifting weights, and looking at the world with a new perspective. This new lifestyle made him feel better than he had ever felt, and the major drop in the scale was just a plus. My father’s first mission was and is to live long and to see his grandchildren one day. His second mission was to change the world by leading as example. His example has in turn changed my interests, passions, and life goals. Why did I change my life as well? While it may seem extremely strange that a 19 year old has been willing to devote her free time to the health of herself and the health of others, it really should not be strange at all. Has our society blinded us to the fact that what you put in your body is actually you? The pizzas, ice creams, cookies, cupcakes, and you name it… Is that what you want to be? I realized I didn’t. I grew up eating that crap, probably more than most people because I was the pickiest eater you could ever meet. I didn’t touch a vegetable until a few years ago, and a daily intake included poptarts and chicken nuggets. I had no idea what I was doing to myself and no one stopped me! I was thin my whole life, even stick-like looking at some points, but it wasn’t until high school that I realized my health mattered. At first I went in the wrong direction, looking for low-cal options to my favorite foods that were still made of crap just less calorie crap. It took a few years for me to learn what healthy eating is and I’m still learning loads of new things everyday. When my dad began his paleo journey, I started beginning my journey as well slowly. I first cut out all gluten and dairy and processed foods like Mr. John, my health coach, had advised (Mr. John had a huge influence on my interest in health). I felt better immediately, my weight stopped fluctuating and the bloat disappeared. I slowly eliminated things that I hadn’t realized until then were actually unhealthy. My diet became more and more resembling what my dad did and I made the decision to transition into the Paleo/Primal lifestyle myself. Yes I’m 19, so many people say “it’s too expensive” or “it’s too hard” or “you’re obsessed” and “I could never do it”. This diet is not any of those things. It’s too expensive– No, no, no, no, no. Before giving excuses, please do some Google searches like “How can I eat Paleo on a Budget?” for starters! And I promise you that you can find hundreds of people explaining how to eat this way on a budget. It’s too hard– I’m sorry to say but eating whole delicious foods is not hard at all, it’s enjoyable and makes you feel good. There are a lot more hard things out there like battling disease or quitting an addiction. Someone following this diet will without a doubt tell you that they still eat delicious foods. Does a steak with pasture buttered vegetables and a piece of fruit for dessert sound so painful to eat…? I enjoy eating every meal I make. I could never do it– Many people can’t find a motivation. Start looking for one because the benefits are numerous: lose a few pounds, clear your skin up, have more energy, sleep at night, prevent diseases and cancer, become a better athlete, YOU NAME IT. But stop giving excuses, start today, because I did. It changed my life and it brought me to this blog to change yours as well.